For more than 15 years, the conventional radiator heating and air conditioning systems are increasingly being displaced by capillary tube systems for heating and cooling. 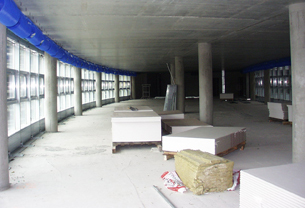 In Europe, more than 150,000 m² cooling ceilings with capillary tubes are installed yearly. S&L Systems has optimized the features and advantages of this outstanding and innovative technology. 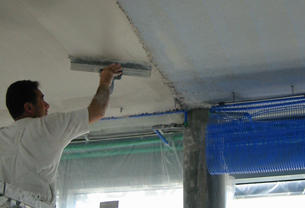 The capillary tube mats are applied directly onto the bare concrete or plasterboard ceiling. The ‘made to measure’ capillary tube mats are completely embedded into the plaster to guarantee an optimum heat conduction between the capillary tubes and the enclosing plaster. The integration of capillary tube mats into walls of different constructions is a worthwhile alternative to conventional heating systems for several reasons. Besides the performance even at low water temperatures and its dynamic response during the cooling and warming phase, especially the high flexibility and the very low installation height which allows later added hidden fittings, are very convincing. Thus, capillary tube mats wall heaters are also suitable for building refurbishment. Another advantage is the possibility that the activated wall surfaces can be used for a very comfortable cooling in summer. 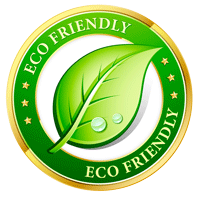 In a lot of cases, the necessary cooling energy can be retrieved almost for free from geothermal energy, for example through capillary tube mats earth collectors. The surfaces are covered with a capillary tube mat in a carrier film. After the adhesive has hardened the area is sealed off using a levelling compound. This system is ideal for retrofitting due to the low construction height and the minimum insertion of moisture with the levelling compound. 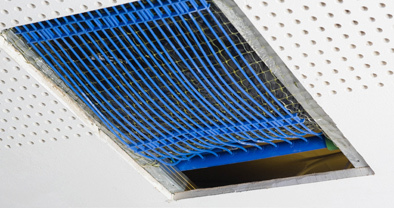 The capillary tube mats are installed between the profiles of the substructure of a sealed drywall ceiling, below a crosswise taut mesh which is covered with insulation. As a result, the capillary tubes are evenly pressed against the drywall panel during tightening and their surface contact is ensured. The ceiling is also available as a perforated acoustic ceiling. Basically, any kind of drywall ceilings can be used, in which the appearance, the installation height and the cooling output may vary. 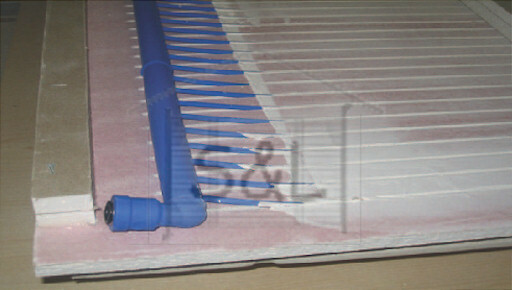 The capillary tube mat is integrated directly into the gypsum board. 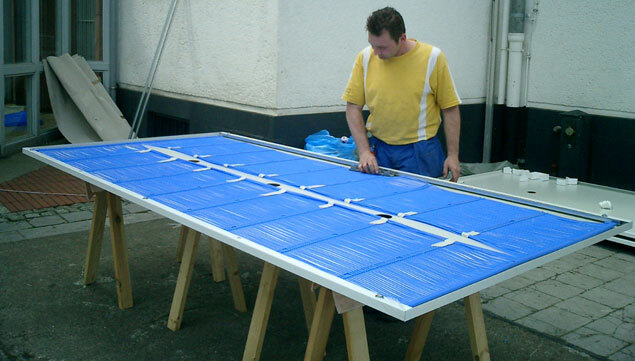 The board is fitted as a finished plaster ceiling module or insert module. 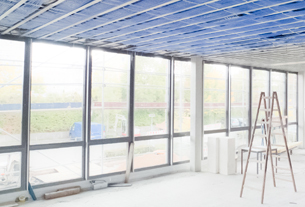 Regardless of ceiling type and ceiling construction, any metal panel ceiling can be converted by the integration of capillary tube mats into a cooling ceiling or into a cooling/heating ceiling. The ‘made to measure’ capillary tube mats are placed into the metal cassettes, so that the maximum heat conduction between the capillary tube mats and the metal panel is given. 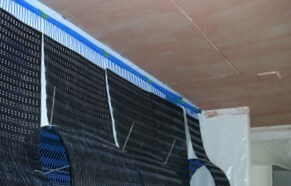 The connection to the supply lines is done by plug-in technology via flexible tubes, which are placed in the ceiling void. 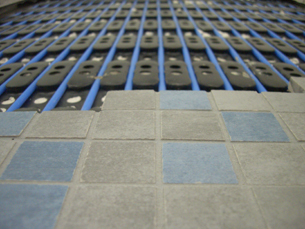 Floor heating systems with capillary tubes can be used for heating all buildings. The water-filled capillary tubes are integrated into the corresponding floor construction and thus enable a smooth tempering of the floor surfaces. Due to the large exchange surfaces, large amounts of energy can be transferred even at low temperature differences between the active room surfaces and the room air. The radiated energy provides a comfortable feeling, since it corresponds with the natural heat balance of the human body. Since the perceived temperature is around 2 -3 °C higher than the actual room temperature, the heating energy consumption is further reduced. By integrating the capillary tube mats directly under the flooring, the system reacts extremely quickly. After only a few minutes, the desired surface temperature is reached. 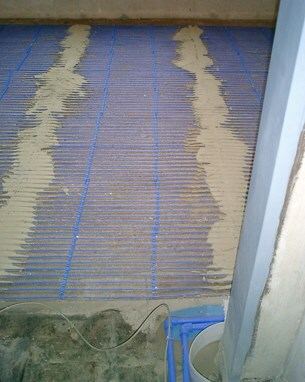 Even with the conventional screed laying method, the capillary tube system requires only about ¼ of the heating times of conventional heating systems. The capillary tube mat is fixed directly on a backing sheet and can be very easily laid on the floor. The water-carrying capillaries are just below the surface making the floor heating very responsive. The difference in temperature on the surface is very low due to the distance of the capillaries being only 20 mm. This version is very suitable for retrofitting existing floors. The capillaries are integrated directly under the raw concrete ceiling or plasterboard ceiling into a layer of plaster or are plastered in. The project-related capillary mats are made to measure and are completely embedded in the plaster, so that an optimum heat conductivity between the capillary tubes and the plaster surrounding them is guaranteed.